Out of 65 animals, only 15 survived. 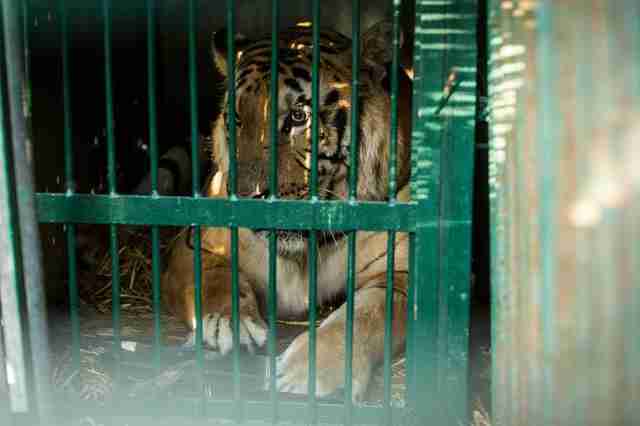 For nine years, all Laziz knew was life inside of a small cage at a zoo in Khan Younis, a town in war-torn Gaza. The zoo first opened in 2007, but earned its reputation as the "worst zoo in the world" after dead, mummified animals were seen propped up next to living ones in 2008. 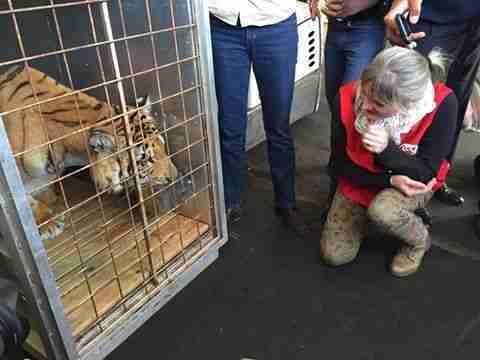 The horrifying discovery came after the zoo's animals had been abandoned for three weeks due to airstrikes from Israel. It wasn't until mid-April of 2015 that the remaining, living animals of the zoo would get the help they desperately needed. Four Paws was the first welfare organization allowed to enter Gaza to check on the animals, and plans to free them were set in motion. 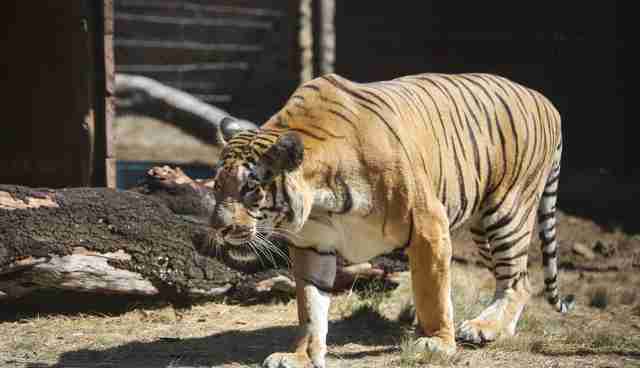 "The surviving big cats - one lioness and a tiger - are penned up in their destroyed enclosures and are highly emaciated," said Dr. Amir Khalil, a veterinarian leading the Four Paws rescue effort, said in a press release at the time. 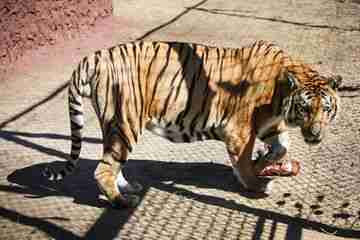 The zoo had opened with 65 animals, though that number dwindled down to 16 - including Laziz, the last tiger in all of Gaza. Then, just last month, the best possible outcome finally came to fruition. "After long negotiations, a daring rescue mission finally has the green light," Four Paws wrote in a press release. "Four Paws is finally going to be able to rescue the 16 animals from Khan Younis Zoo in the Gaza Strip and not only transfer them to new homes, but close the so-called 'worst zoo in the world' for good!" Birds, monkeys, tortoises, porcupines, an emu and Laziz were all rushed to safety - most of the animals found a new home in Jordan's New Hope Center. 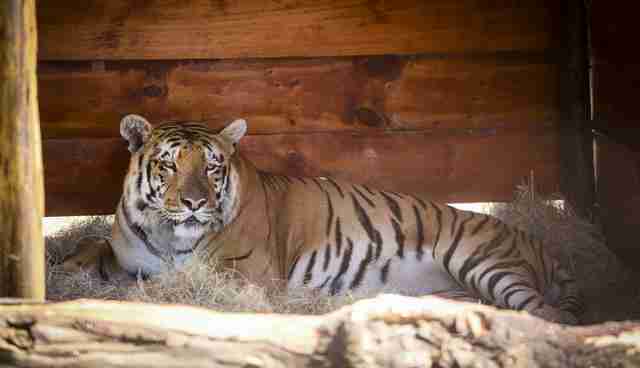 Laziz was transported to Four Paws' Lionsrock Lodge & Big Cat Sanctuary in South Africa. It seemed Laziz was more than ready for a new start in life. According to Four Paws, Laziz's new home features two acres of grassy land and a swimming pool. 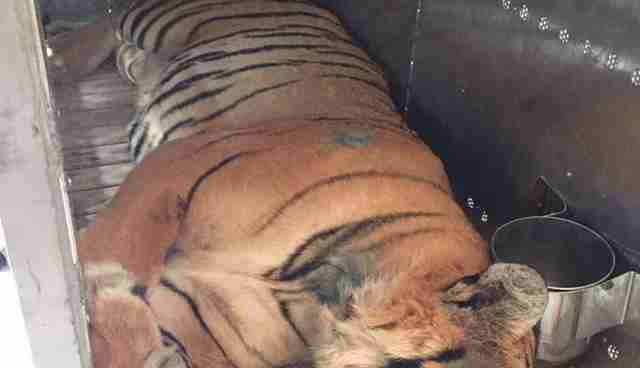 "Laziz made a start and went into his transport crate without hesitation," Four Paws wrote on Facebook in late August. "He even seems to behave more calm in the crate now than he ever has in his desolate cage." Throughout his transport, Laziz was pampered with fresh water, food and "air conditioning" - his crate was kept cool with ice and a fan. 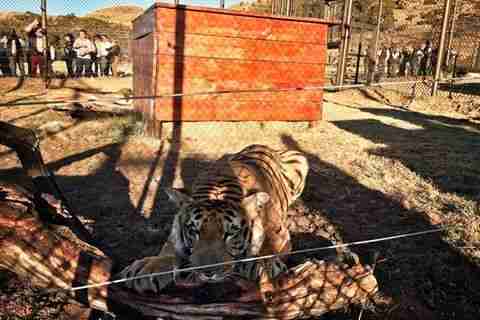 The tiger arrived safely in South Africa and was released into the sanctuary just a few days ago. He's been using his time to soak up the new sights and smells of his tranquil surroundings since, Four Paws said. "We had the impression that he was so relaxed and confident when he arrived , but he is actually quite sensitive and will take more time than expected to come out of his shell and feel safe in his new home," Fiona Miles, country director of Four Paws, told The Dodo. 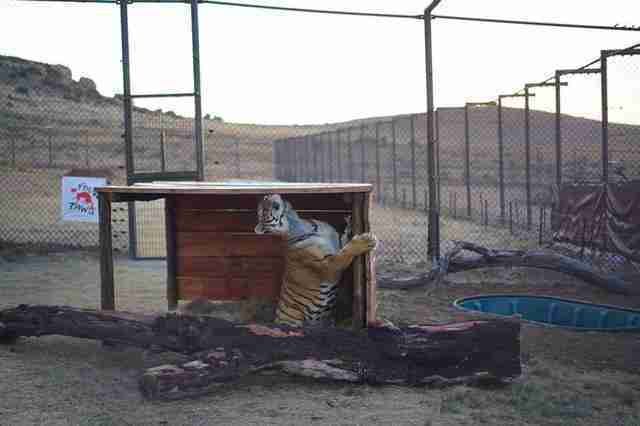 He mostly keeps to himself for the time being, but is finding security and comfort within the structures of his new enclosure - which is all normal behavior for newly arrived rescued animals. "I can also imagine that the silence around him at Lionsrock compared to the noisy and violent environment in Gaza is very new for him," Hildegard Pirker, head of animal welfare at Lionsrock, told The Dodo. "He is barely reacting when we are talking to him or calling his name, but I am sure this will eventually change." In the meanwhile, Laziz continues to enjoy his new life, stretching lazily in the warm African sun, surrounded by caretakers who will be there for him every step of the way - a far cry from the sad and isolated life he once lived in Gaza.